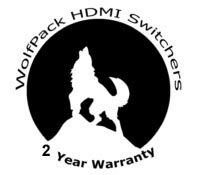 HDTV Supplys WolfPack 16x24 HDMI Matrix Switch is a pack of high performance video and audio modular matrix switcher that circled the competition to devour them. This WolfPack 16x24 HDMI Matrix Switch is a preconfigured matrix switch using a card cage and two 8-port HDMI input cards and three 8-port HDMI output cards making for a 16x24 true HDMI Matrix Switch that the number of inputs can be field expanded by 16-more HDMI inputs and 8-more HDMI outputs. This 16x24 HDMI Matrix Switch allows any of 16-HDMI inputs to be routed to any of 24-outputs; or the same input to be routed to all outputs, or any combination. The WolfPack 16x24 HDMI Matrix Switch is a high-performance professional switcher built for cross switching between multiple HDMI Video and Audio Signals. The 16x24 HDMI Matrix Switch can be controlled via push buttons, RS232, IR Remote (IR) control and TCP/IP. The above optional HDMI extenders are stand alone units having a transmitter and receiver and 2-AC adapters. The matrix has 24-female HDMI outputs. The base model of this WolfPack 16x24 HDMI Matrix Switcher is at WolfPack Modular Matrix Switcher. Why not buy this WolfPack 16x24 HDMI Matrix Switch today? NOTE: This special order built matrix is not in stock as we custom build each unit. The unit has a three year warranty and is non-returnable and non-cancelable due to it being a custom built switcher. HDBaseT transmitters and receivers are not interchangeable between manufacturers so call us at 800-841-9238 with your HDBaseT needs.